Christine is from Sweden, David is from Oklahoma, they met in Greece and they will be living in Colorado, but they decided that they would be married in Maui with Hawaiian Island Weddings. How does that all fit together you may ask? 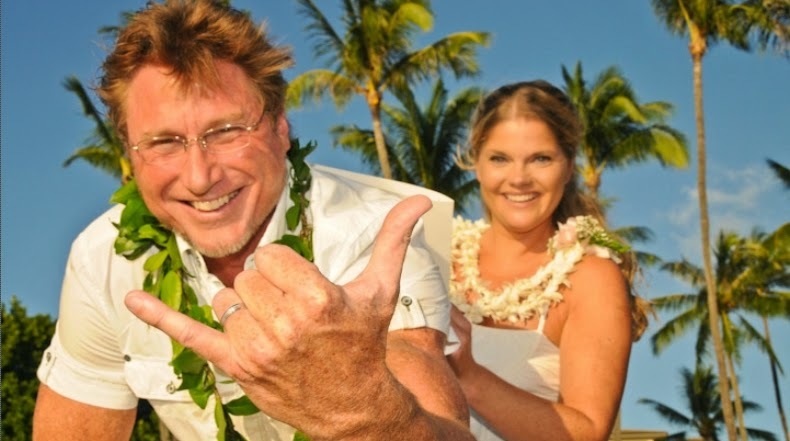 Well, it's a long story I bet, but they had planned to vacation over the Holidays in Maui anyway, but didn't know if their fiancée Visa would come through in time to have their dream Maui wedding on the beach. But, it did! So Maui was in the cards. Christine's daughter and boyfriend even flew in from Sweden to be there for them. They were married by seasoned Hawaiian minister Rev. Kamuela Rodrigues with his non-religious Hawaiian style ceremony. Photos were created by owner/ photographer Tim Clark, who has been photographing couples in Maui since 1988. Although any beach will be crowded on a Saturday, Kapalua Bay Beach became the backdrop for their heartfelt ceremony. It was a gorgeous day... the sun was shinning but it wasn't hot as the cool ocean breezes kept the group cool. The couple exchanged traditional Hawaiian leis, a Maile Leaf lei for David and a two-stranded tuberose lei, with it's fragrant blossoms, for Christine. They also honored their daughter and boyfriend with their "Aloha" by presenting them with fresh white orchid leis. Seasoned on-site wedding coordinator Elizabeth Clark was there to help with Christina's bouquet and hold the wedding certificate. Their ceremony lasted 15 minutes and Rev. Kamuela sang a Hawaiian song. Afterwards they signed their marriage license and posed for family photos.